There are a lot of Las Vegas hotels off the Strip, but Palace Station is renowned for being the locals' favorite place to stay. Featuring a variety of opportunities for excellent dining, exciting gaming, and fantastic entertainment, Palace provides the full Las Vegas experience without the full Las Vegas price tag. 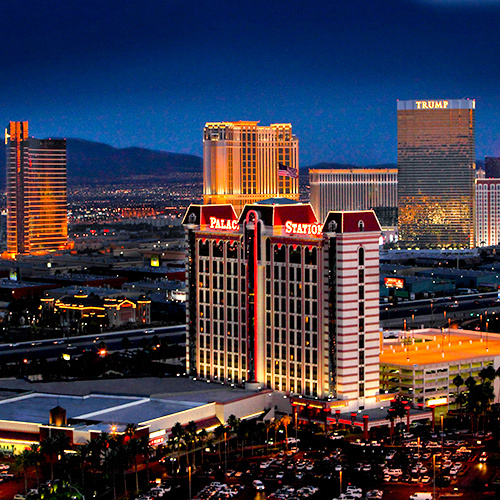 Just a couple minutes from the Strip, Palace is in the perfect position to serve as both a refuge from, as well as a gateway to the world-renowned Strip. When you're looking to strike a balance between location, luxury, and affordability on your next trip to Vegas, remember there's no better choice than Palace Station. With more than 100,000 sq. ft. of gaming space, Palace Station gives you more chances to cash in. Our casino in Las Vegas features just the right mix of slots and table games ready to meet your every gaming desire, including one of the biggest varieties of baccarat and pai gow tile games off the Strip. • 45 table games including blackjack, pai gow poker, Pai Gow tiles, Ultimate Texas Hold 'Em, craps, roulette and baccarat. • Asian table games area includes Pai-Gow Tiles and Mini and Midi Baccarat with our no-commission EZ baccarat, along with Dragon 7 and Panda 8 side bets. We also have Dragon Bonus for our Midi Baccarat games. • 24-hour 9-table non-smoking poker room. • 307-seat bingo hall open 7 days a week with sessions running every other hour from 9 am to 11 pm. • 230-seat race & sports book featuring 44 screens. When it comes to incredible value dining in Las Vegas, Palace Station is the place to be. Featuring a wide variety of high quality, yet affordable restaurants, we've got something for everyone. Whether you're looking for a fine dining experience, or some food on the run, you're sure to find something at Palace that suits both your tastes, as well as your bankroll.